The Association of Mars Explorers has restructured its Board. The new Board will take the organization into the next two years with a new strategy. The Board consists of Donald Barker, Bill Clancy, Charles Cockell and Andrew Schuerger. Several new members will join in the coming months. AME is developing plans for a conference in 2013/2014 on Mars exploration. Guy Murphy, Mars: A Survival Guide is available from Harper Collins. The Mars Club is hoping to present a series of short interviews with Mars researchers and analog expedition participants. 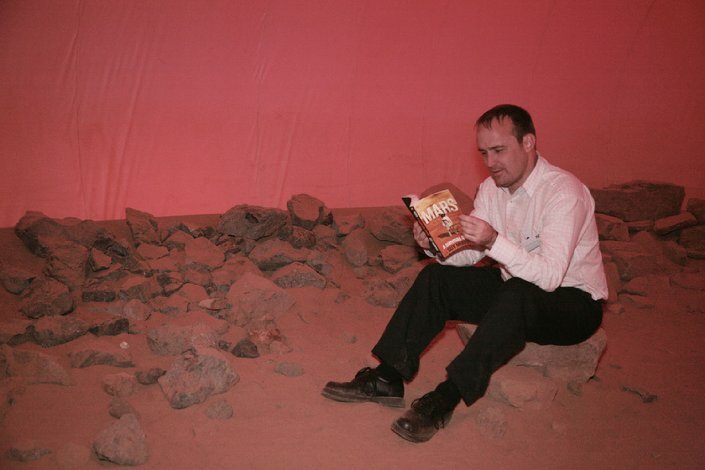 The first interview is with Guy Murphy, past president of Mars Society Australia, and an author of a new book called Mars: A Survival Guide. Tell us a memory from your first (or any) mars analog experience. My first Mars analogue experience was the Mars Society Australia’s Jarntimarra Expedition in 2001. This was a 2 week trip through the Australian outback with scientists cataloguing Mars analogue sites in South Australia and the Northern Territory. While the outback is integral to Australian national identity, most of us never go there. I was in awe at the variety, beauty and strangeness of many of the place we visited. It made me realize Mars has more than just flat plains with rocks scattered on them. It was a privilege to have the significance of the landscapes explained to me by expert planetary scientists. I work with heritage buildings in my day job, and it struck me that many of the issues encountered by early human explorers and settlers on Mars are universal ones humans have always faced on frontiers, including in places such as Australia, the US and Canada. The books is thematically divided into chapters dealing with specific issues such as how to build, find resources, travel around, adjust psychologically, conserve the environment etc. I could have equally included a corresponding section in each chapter on how these themes played out in settler societies on Earth. Tell us some of things about Mars or Mars scientists or space technology that inspired you to be involved in Mars research and exploration and promotion. I remember marvelling at the first images the Pathfinder lander sent back in 1997. They really gave me a sense of Mars as a a place where humans might one day walk, but also of how distinctively different the surface environment was visually. Interplanetary space probes exemplify human creativity and engineering at its very best, and I marvel at the ingenuity of each new generation of surface probes. I think the instinct to explore and settle new places which led to the creation of the society I live in today has never left us. Mars is the next logical place for humanity to expand to in our era, just as the New World once was in another. Hopefully this time there will be greater concern for protecting the pristine environment. If you’ve enjoyed this interview and/or have suggestions for Mars explorers to be interviewed in the future, please comment below or use the form in the sidebar to send your question / idea to the webmaster. On April 5th, 2011, Baruch Blumberg passed away. Barry was a founding member of the Association of Mars Explorers. All of us here wish to express our grief at his passing, and our gratitude for the years Barry was in our lives. Baruch Blumberg’s life story is remarkable. A scientist who seemed unbridled by convention, Barry moved easily from groundbreaking work in virology (where he won his Nobel Prize) to the young science of astrobiology. Whether serving with the US Navy during WWII or later contributing to his beef farm in Maryland, Barry’s enthusiasm for life permeated everything he touched. He will be greatly missed by all those who knew him. AME’s biennial dinner is once again being held in conjunction with the Astrobiology Science Conference. Please see the event page for the press release and additional information. April 27 @ 7:30PM – La Brisa Mexican Grill, 501 North Wesley Drive, League City, TX. The Association of Mars Explorers is revamping its website to provide more streamlined communications with its members, easy control of subscriptions to our newsletter, a nicer look, and an easy way to submit applications to become a member.